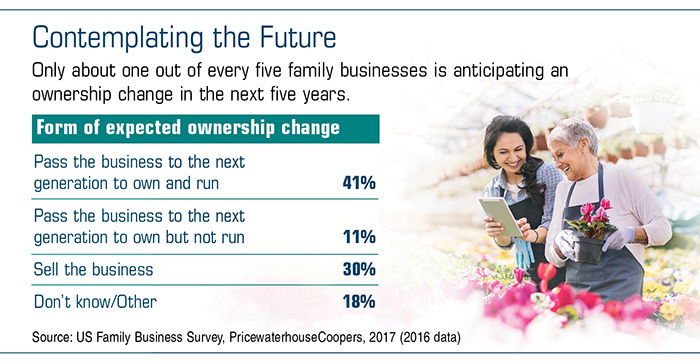 One challenge faced by family-run businesses involves transitioning both the ownership and operations from one generation to the next. A family limited partnership (FLP) is a legal agreement that enables business owners and their heirs to address tax issues, business succession, and estate planning needs all at once. Specifically, business owners who want family members to inherit their businesses in the future could use FLPs to transfer assets out of their estates during their lifetimes. Moreover, the owners of a valuable business might begin this process many years before they intend to give up operational control. The IRS calculates the estate tax due on an individual’s gross taxable estate by adding the value of all owned assets, including a home and a business, and subtracting any applicable exemptions. Even if the taxable estate falls below the current generous federal estate tax exemption level ($11.18 million, or $22.36 million for a married couple, in 2018),* the family might not be entirely out of the woods, especially if they live in a state that has an estate tax or an inheritance tax with a lower exemption amount. When business owners fail to consider that federal and state estate taxes could be due upon their passing, the money needed to cover the bill may not be available, and their heirs may have to borrow the money or liquidate the family’s business. With an FLP, general partners run the business. Limited partners (such as the children of general partners) have no vote and no say about day-to-day operations, and they are not liable for the debts of the FLP. A general partner (or a corporation or limited liability company controlled by the general partner) can gift ownership shares to limited partners in installments that conform to the annual gift tax exclusion of $15,000 per recipient (in 2018). And because limited partners have restricted rights, these annual gifts may be discounted up to 35% from fair market value. For example, more than $22,000 worth of property or business shares (currently valued at $15,000 for gift tax purposes) may be transferred to each limited partner without triggering gift taxes. Of course, every family’s situation is different, and actual results will vary. Setting up a family limited partnership can involve complex tax rules and regulations, as well as up-front costs and ongoing expenses. Be sure to consult with your tax and estate planning professionals. *The federal estate tax exemption is scheduled to revert to its 2017 inflation-adjusted level in 2026. Securities offered through Broker Dealer Financial Services Corp. (BDFS), Member SIPC. Investment advisory services offered through Investment Advisor's Corp., and SEC Registered Investment Advisor. Martin Capital Management LLC. is not affiliated with BDFS. Federal and state regulations prohibit registered persons from soliciting, offering and/or selling any investment products or services unless they are properly registered and licensed in each state jurisdiction. Not all products and servicesv referenced on this site are available in every state and may not be available through every representative listed. NeithervBroker Dealer Financial Services nor its representatives offer tax or legal advice. Please contact your legal or tax advisor regarding your situation.